We first previewed the AMD Ryzen Threadripper Gen 2 launch at Computex 2018, and the chips have finally arrived. Headlining this generation is increased core counts with the AMD Ryzen Threadripper 2990WX at 32 cores/ 64 threads and the AMD Ryzen Threadripper 2970WX at 24 cores/ 48 threads. Compare this to the original generation’s 16 core/ 32 thread top bin SKU and you can see why this is a big deal. Beyond the raw core count, these chips also benefit from a next-generation process and architecture. Pricing starts sub $1800 for the 2990WX which is superb. All of this does not come for free though, AMD made a major trade-off to deliver this part in the existing X399 platform. In this article, we are going to introduce the new AMD Ryzen Threadripper Gen 2. The biggest architecture update is perhaps the actual packaging, but we wanted to highlight two updates with this generation. 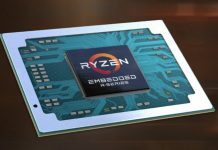 These are similar updates to the AMD Ryzen Second Generation. 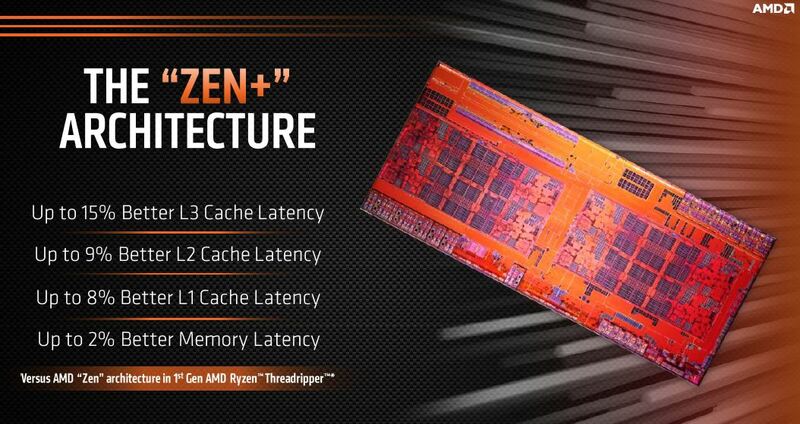 First, the CPUs utilize AMD’s Zen+ architecture. That has a few implications. AMD highlights the better cache latency. That is a big deal since AMD already had a lead over the Skylake-SP parts in cache latencies. The other major update is a change to the 12nm process. That allows lower power at a given clock or higher clock speeds. It also means that this is the first publicly available 12nm or lower AMD socket SP3 part on the market. Here is where things get interesting for the high-end server crowd. If your yearning for cores made you think about a lower clock speed AMD EPYC 7551P, AMD now has a significantly higher IPC option for you. 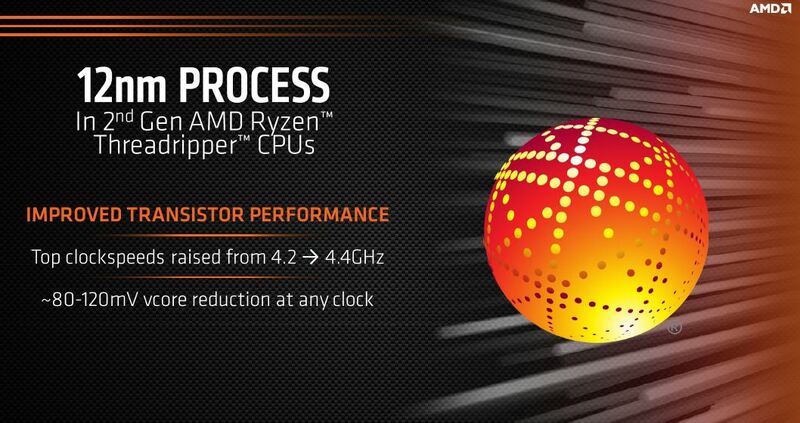 Since they are Zen+ chips, that also means that AMD gets better granularity on holding turbo boosts. If you want to utilize a low-memory footprint high core count desktop part, AMD now has a really interesting solution. The actual parts themselves are socket SP3. 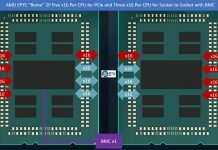 That means that the chips utilize the same physical socket as the AMD EPYC parts, but are intended for the X399 consumer platform, not the EPYC platform. Using that large package means that AMD has four die spots onboard. 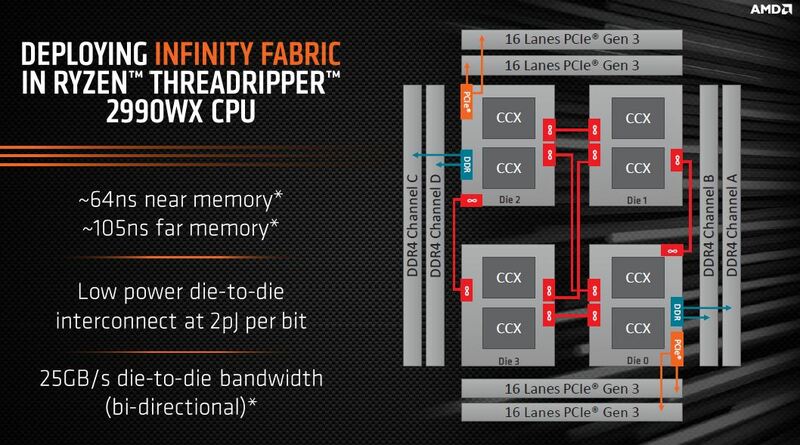 Like with the AMD Ryzen Threadripper 1950X, the lower core count chips utilize two active dies. Each die has PCIe lanes and two DDR4 DRAM channels attached. The two chips utilize on-package Infinity Fabric. 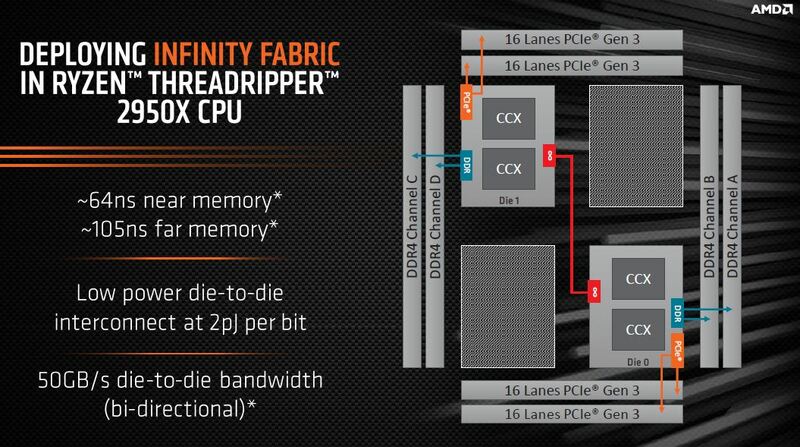 Since AMD Infinity Fabric speed is related to memory speed, increasing JEDEC memory support to DDR4-2933 means that the fabric performs better. Henceforth, if you want a 16 core AMD workstation platform, the AMD Ryzen Threadripper 2950X is a clear upgrade over the previous generation1950X. For the “WX” series CPUs, the AMD Ryzen Threadripper 2990WX and 2970WX, AMD places four of the 12nm dies onto the SP3 package. This is similar to the AMD EPYC 7001 “Naples” packaging, with a few major differences. The 24 and 32 core count AMD Ryzen Threadripper Gen 2 parts have two dies that are compute only. That means that their only access to memory is through the two chips that are connected to DDR4. Likewise, PCIe access is through the two chips that attach to the PCIe lanes. Essentially there are two 8 (2990WX) or 6 (2970WX) islands that need to hop over Infinity Fabric for anything. We published a piece on the memory population impacts for AMD EPYC “Naples” generation which is important when looking at base configurations from companies like HPE. See AMD EPYC Naples Memory Population Performance Impact. There are some tasks where leaving AMD Zen(+) cores on Infinity Fabric islands makes sense. For example, in some rendering scenarios, there is little to no impact as we showed. In others, there can be a large impact. In client-server workloads where you are pulling data over the network, this is especially noticeable. You would typically see this when, for example, using NVMeoF storage with your AMD Ryzen Threadripper Gen 2 workstation and 25GbE Ethernet. With CPU launches that we cover, we show a view of how the SKUs stack up in terms of pricing. Here are the four SKUs with the AMD Ryzen Threadripper 2990WX and 2950X available today. One will notice that the TDP is much higher with these parts. AMD is using a TDP for its 16 core parts equivalent to the AMD EPYC 7551P 32-core CPU. The 32 core parts are hitting 250W which is about what we expect to see as the top end for next-generation server CPUs like Intel’s Cascade Lake and AMD EPYC “Rome” generation. Comparing these to the previous AMD EPYC single socket CPUs is quite interesting. You can see that the current generation of AMD Ryzen Threadripper Gen2 parts have a simple pricing methodology between $54-$56 per core. AMD EPYC 7401P and AMD EPYC 7351P parts are priced in the $44-47 range. At the top bin, the AMD Ryzen Threadripper 2990WX is priced much lower on a dollar per core basis than the AMD EPYC 7551P. That is a bit unfair of a comparison. We know many of our readers have contemplated using AMD EPYC “P” series parts for workstations since their introduction. 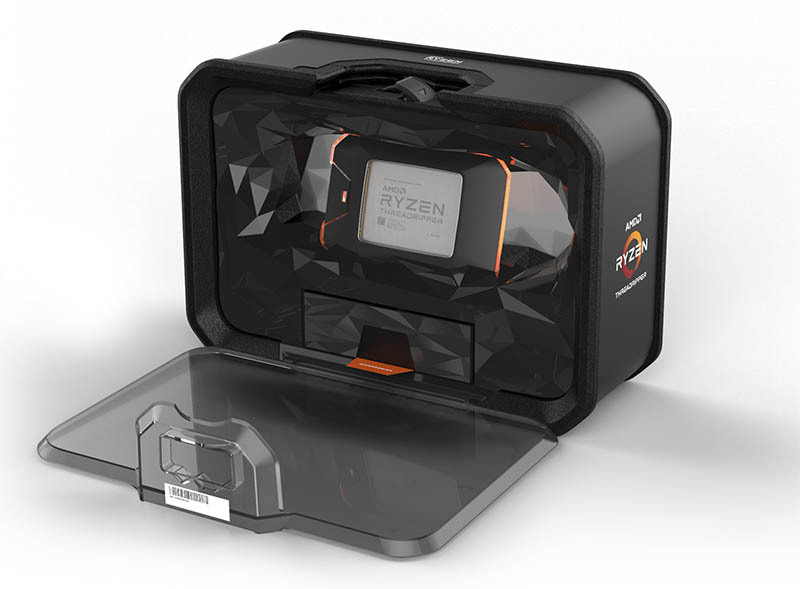 We generally thing clock speeds for workstation use cases are too low, and the AMD Ryzen Threadripper Gen 2 highlights a better solution. On the other hand, AMD EPYC provides much more RAM and PCIe connectivity for truly high-end workstations. The absolute slam dunk would have been if AMD Ryzen Threadripper Gen 2 went to 1 DIMM per channel with RDIMM support. That product would take over not just the workstation market, but also an enormous swath of the server market. If we could put such a product into a server, we would be driving to the data center today to replace every last Intel Xeon E5/ Scalable server, after replacing my personal desktop with the 2990WX. For the workstation market, the for NUMA node layout is more than many OS schedulers can efficiently handle in consumer applications. Single and dual NUMA nodes are still the sweet spots. Having run the AMD Ryzen Threadripper 1950X in my personal workstation, replacing my previous generation dual Xeon E5 V4 workstation, I can tell when I am above 62-68GB used by Windows 10 as the NUMA access starts to introduce a jitter that was not present on the dual Intel Xeon E5 system. Still, the higher clock speeds make up for the difference and I now offload more to EPYC servers with a more appropriate core to memory ratio. At the same time, AMD Ryzen Threadripper Gen 2 simply offers more. Intel does not have anything with this many cores at this price range. Threadripper is also an awesome product name here. If your goal is to impress colleagues or potential new hires, AMD Ryzen Threadripper Gen 2 is where the smart money is at right now. Those using workstations to create care about their technology and Threadripper Gen 2 is what will help retain knowledge workers in today’s market. What to buy? a $ 1.800 TR2990WX that overclocks easy to 4 GHz all core with quad-channel DDR4-3200 CL14 and has 60(16+8+16+8+4+4+4) free PCIe 3 lanes or a $ 2.100 EPYC7551P that overclocks easy to 3.8 GHz all core with octa-channel DDR4-2666 CL16 that has 92(16+8+16+8+16+8+16+4) free PCIe 3 lanes. Not me, but Der8auer has on an Supermicro board with a EPYC 7601 upto 4 GHz stable running a burn in with Prime 95. 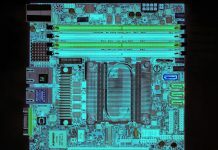 The draw back of the Supermicro is the weak power supply and the problem with the connection between the socket and the CPU. He also did a dual setup with an ASUS board which has a much better power supply. The board I would choose is the Asrock Rack EPYCD8-T2, put a fan on the heatsink of the power supply and your good to go drawing 60 amps per VRM 6+1. To be on the save side I would go for 6×50 amps at 1.2 volts makes 360 Watts CPU only. Get some ECC-RDimms with samsung B-dies on them and you can set the CL to 16 instead of 19. You can raise the speed of the DDR4-2666(it’s still locked, till…..). Just wait a couple of weeks and the internet will be filled with how to do it. On the other hand the TR2990WX works straight out of the box and 32 GB UDIMM’s are on the way. @Misha that isn’t a real system if it isn’t a publicly available OC method. EPYC wasn’t so great with MySQL and other databases and i guess the gen 2 Threadrippers isn’t that great at database workloads either? Will STH test this? @tonyalverez Well it’s available to me and I am kind of public, I just don’t have an EPYC. We first need 2 storage servers so I don’t see it comming for a while. EPYC7551P is standard more than capable enough to drive a 1 PB SAS12 storage driver with 6x 905p’s in raid 10 as write cache (and maybe 2x 905p’s as read cache). Of course I will try it on the EPYC7551P when it arrives. Who supports the overclocked EPYCs? Where’s the info on how to? How about the Gigabyte X399 DESIGNARE EX, you can even get Thunderbolt 3 working on it (just not hot plug/swap at the moment). You don’t have to use the wireless and the RGB. I have just closed my case, all-black.